It’s summer now! 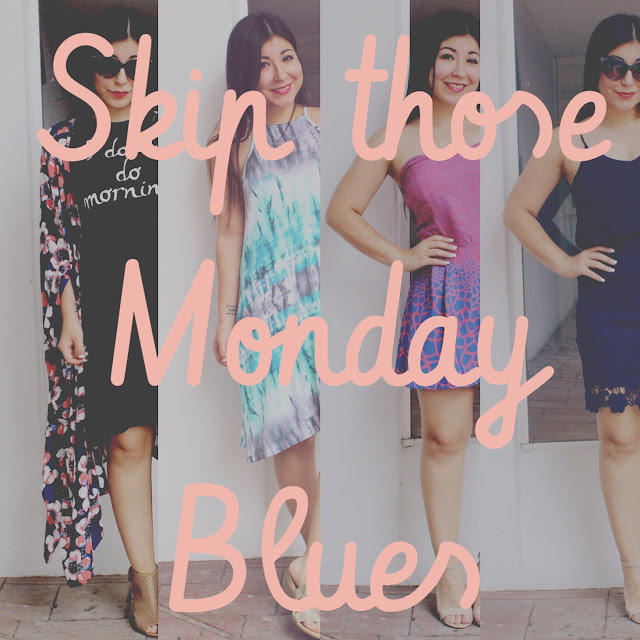 So whether your on summer vacay at the beach, hanging out around town with your girls, or still having to work during the week; these are outfits are perfect for you to beat those Monday blues. 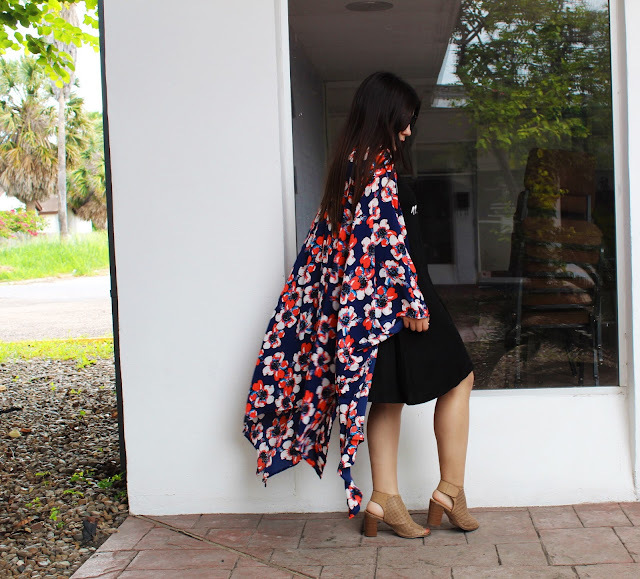 These outfits will definitely make you feel at your best, and most stylish. statement tees are so great, and such a fun summer trend. I love how they speak for you without you having to speak. “I know guac is extra”, “sunday funday”, “but first coffee”, are a few of my favs, but this one is perfect! ‘I don’t do mornings’ is so fitting for probably all of us on a Monday morning, Monday mornings are for our coffee being venti, and our clothes being comfortable just to get us to 5 o’ clock! I love this (in this case) statement dress, it’s so comfortable and black, who doesn’t love the color black?! I added a kimono, to give it a dressy look and some casual wedges. 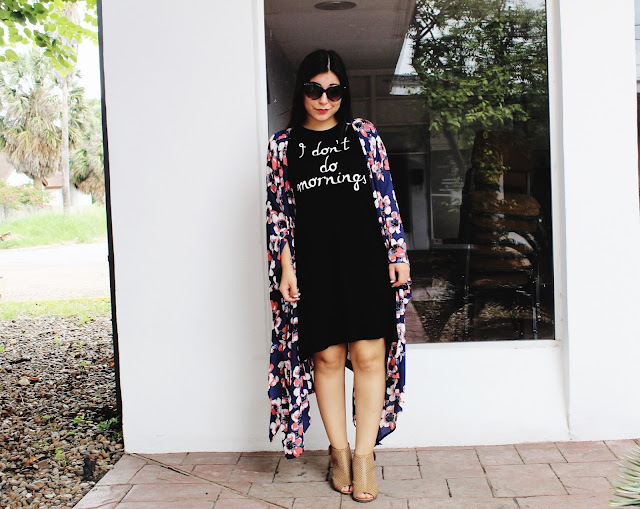 This would be a great look to get brunch with girlfriends, you could also use the kimono as a beach cover up for a sophisticated beach look. Both of these pieces are so versatile, and don’t have to be just worn together but also as separates. Like I said in my last post, tie-dye is always in! I love the spaghetti strap style of this one. It’s such a simple dress but the design gives it so much to look at. I paired this outfit with some simple gold sandals for a simple day of errands around town. Of course this dress is also perfect for a day at the beach, or even to work if you can dress somewhat casual, just add a blazer to give it a professional feel. Monday nights sometime call for a little unwinding and this romper is nice for dinner and drinks with girlfriends, or even a special someone. I love the bright colors on this romper, and it’s a perfect eye-catching piece. You could also add a white blazer if you feel uncomfortable showing off your arms (I know I do at times) and add some neutral heels. 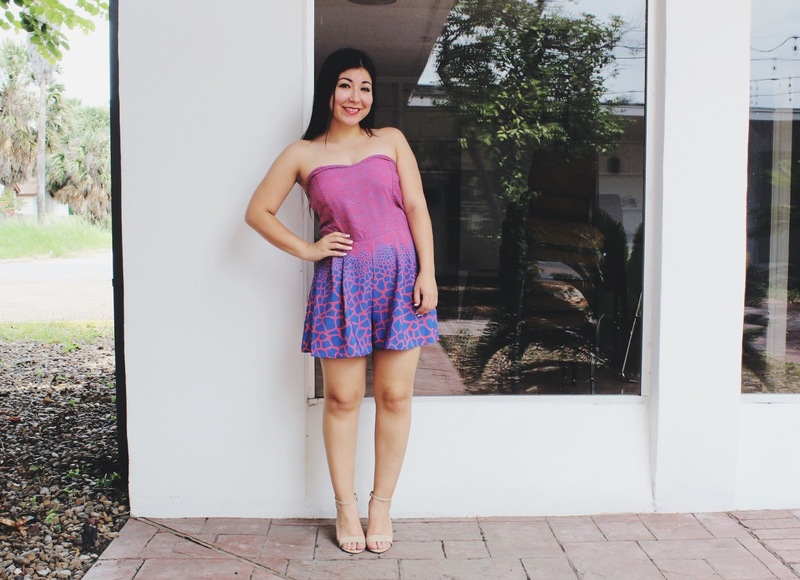 The thing I loved about this romper was that it is absolutely comfortable, and easy to move in, so great! Some people may be on vacation already, while other are still waking up early to go do that daily hustle and bustle. I love this dress because it can be worn for a fancy event, or add a blazer and can be worn to work with some pumps. 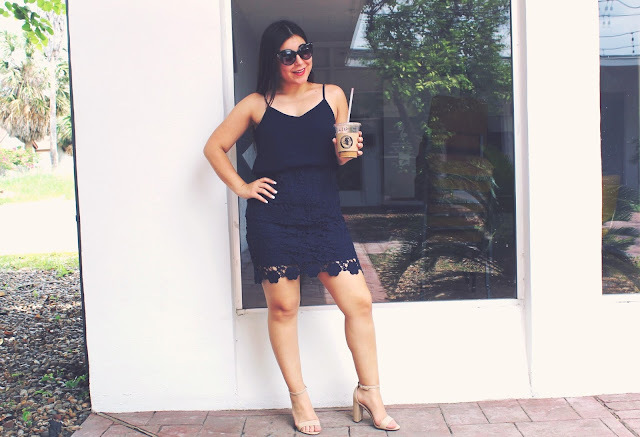 Navy is such a flattering color on anyone, so I feel like this dress can be perfect for any body type. It’s also really comfortable, and to me the thing about fashion is comfort is key!